Delivered in October 1962 to Gotham based operator South Notts, 80 was the last bus ordered by this operator with an exposed front radiator. It has a body seating 33 passengers upstairs and 32 in the lower saloon. It was built to a lowbridge layout which mean that the upper deck seats are arranged in rows of four, with a sunken gangway down the offside. The reason for South Notts buying buses with this layout, which had a lower overall height as a result, was the 13’ 6” Great Central Railway bridge on Wilford Lane. 80 operated on South Notts routes until it was withdrawn from service in March 1984, which made it the longest serving front engine bus in the fleet. As was the way at South Notts, the bus was not sold, but parked up at the back of the depot along with many other withdrawn buses. Subsequently 80 was privately licenced in 1985 and attended a number of rallies. Just prior to South Notts being acquired by Nottingham City Transport, 80 was purchased from the company by Arthur Dabell, the owner of South Notts, and was placed under the care of the bus group at Ruddington Heritage Centre. In March 2007, the Dabell family decided to donate the bus to the Notts and Derby Heritage Transport Group, the forerunner of NHVC. Since then, the bus has been undergoing an extensive restoration process, a long job due to the large amount of wood used in the construction of the body, all of which has been replaced, and the need to renew most of the lower deck floor and the upper saloon sunken gangway, due to the ingress of water. The engine supplied with the bus from Ruddington was found to be the wrong type and unserviceable, the original engine having been removed some time before. We have now acquired a suitable low hours engine, which was used as a standby generator at Kings Cross Station. Work continues to get this engine ready to fit back into the bus. Work continues on 80 to restore it back to original condition. 80 was the last exposed radiator bus supplied to a well-respected local operator, and represents a type of bus operated by them for many years. 80 NVO, Chassis No. 620171 was new to the South Notts bus company of Gotham, Nottinghamshire on the 19th of October 1962. It was the last exposed radiator sunken gangway forward entrance Leyland PD3 to be produced. The low height bodywork is by Northern Counties to L33/32F layout. It was to operate daily until March 1984 when withdrawn from active service with South Notts of Gotham. This made it the longest serving half cab, exposed radiator, front engined bus in the operational fleet. From then until the sale of the company to Nottingham City Transport in 1991 it was retained for occasional use and promotional work. 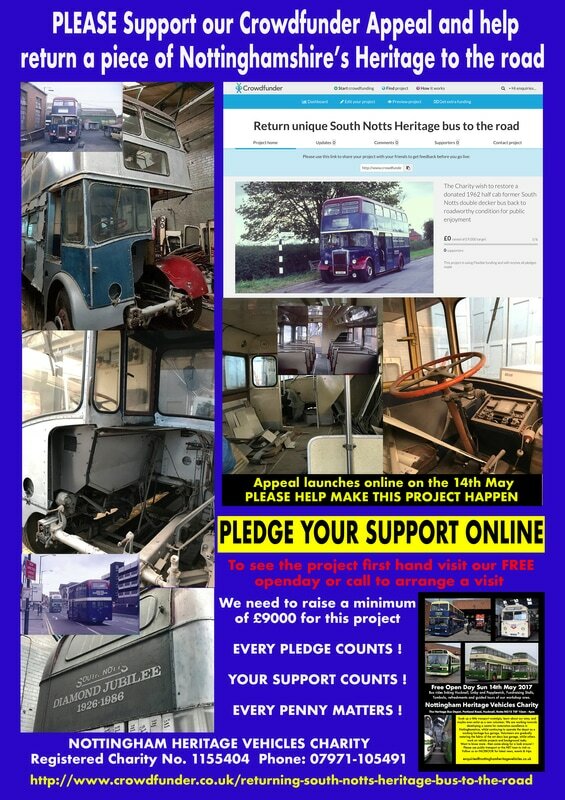 On the sale of the company this vehicle along with two other South Notts buses was handed over to the Heritage centre at Ruddimgton for their care and restoration - although ownership was retained by the Dabell family. Following the arson attack at the site of the Nottingham Transport Heritage Centre in February 2007 the Dabell family took the decision to remove their vehicle from the museum. After discussions with ourselves we agreed to 80 joining our collection with ownership being transferred upon removal from Ruddington. This was facilitated with the help of Paul Winson. After much deliberation it was decided to move the bus to Pauls premises in Loughbough for initial assesment. This proved to be a good move as the vehicle was found to be in a poorer state than first envisaged. As with all our vehicles the first stage of the body overhaul is to remove the entire outer skin, usually unearthing a bag of worms and plenty of headaches ! Much to our suprise some of the steel frame remained in usable condition, although little of the original timber infills were present. Work is also being carried out to find an original Leyland 600 engine for 80 instead of the Leyland 680 which was in the vehicle when at Ruddington. South Notts 80 is currently undergoing major restoration in our workshop. News reports will appear on our blog whilst this page is under construction. Please note this is a huge project so any help is most welcome.